Lets face it I have a lot of "favorite birds". My very favorite is usually the species I happen to be working with at the moment. Having said that, the Common Nighthawk is fascinating and really is one of my favorite birds even when I am not working with them. 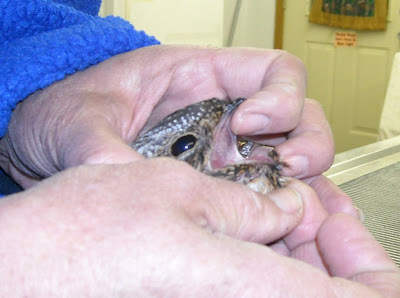 I was fifteen years old when Bob Dana, of local Audubon fame, brought my first Common Nighthawk patient. 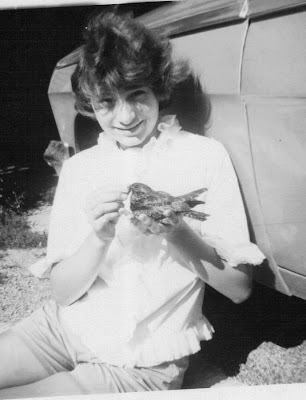 I was young, but in part due to my late fathers job as a Deputy Conservation Warden with the State of Wisconsin, I was already taking care of orphaned or injured birds. The first Common Nighthawk I had ever seen close up was the one Mr Dana brought me on a June evening. She was not yet fledged and somehow had fallen from her nest site on top of the bank building in my town. She had a broken mandible and was not in good condition. With my parents help I set about caring for her. Nighthawks eat only flying insects. They are not small birds so their calorie need, and therefore numbers of insects they need to eat daily is huge. 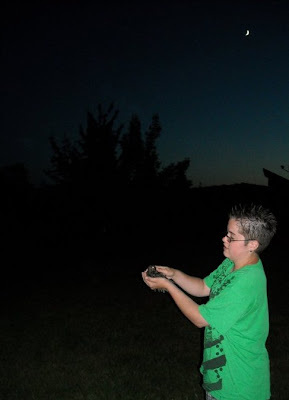 My social life that summer was limited to catching moths,LOTS OF MOTHS, at the street light with my friends. I named the little female, "Snookie". She lived with my family for four years. We gave little Snookie opportunity to leave with her own kind. She flew with them for a few hours and always landed back at our house waiting to be brought inside. She was imprinted to humans. I know that now, but little research was done in the 1960's when this saga occurred and we didn't know it then. In fact very few nighthawks had been cared for in captivity by that time. That is enough ancient history for today. The nighthawk in the photo above was our recent patient. She was admitted with starvation and a wing injury. Nighthawks are members of the Nightjar family. An interesting name for an interesting family of birds. Night jars mode of hunting insects is to fly though the air with their huge mouth open. Insects are gulped down as they enter the mouth. 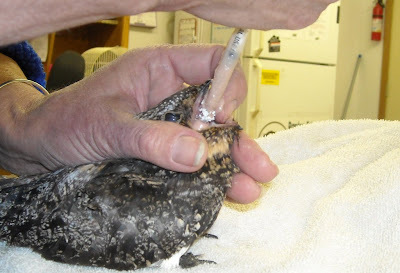 Most nighthawks are not in captivity long enough to learn to eat on their own. That was the situation with our patient. Every bit of food she ate was fed to her by REGI staff. The fact that this beautiful bird survived and was released back to the wild speaks volume about my dedicated staff. Her release to the wild was a cause for celebration at REGI. She was a fascinating patient. The interns learned a great deal from her while she was with us but everyone was delighted to see the beautiful bird take her freedom once more. Our patient was lucky to have been found by a concerned citizen and brought to REGI for care. 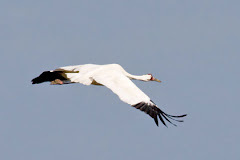 She will be migrating from our area around August 22-26. Central or South America will be her winter home. We hope she will be back in WI next May in time to have a family. 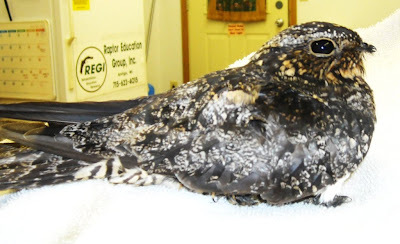 Sadly, nighthawks like many insect eating birds are decreasing in numbers. The article below was taken from the Hawk Ridge Observatory spring/summer 2009 Newsletter. It is a terrific article and offers some good information on the nighthawk. 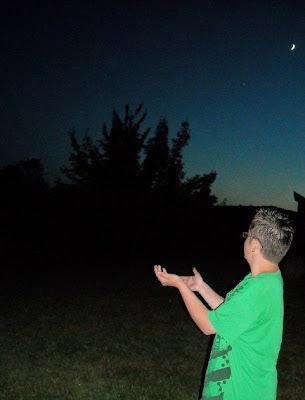 Check out Hawk Ridge Observatory while you are at it. They do some fine work there particularly with migration. The North Shore of Lake Superior has been well known as a corridor for the migration of Common Nighthawks. The migration is concentrated in a time window from mid to late August with a peak usually around August 20-27. Sporadically from 1983 to 1996 Duluth Audubon’s Hawk Ridge Committee sponsored Nighthawk counts at both Hawk Ridge and the Lakewood Pumping Station (Congdon Blvd.). Other incidental counts in the Duluth area from 1983 to 2003 turned up some impressive numbers of migrating Nighthawks. Peaks include: 43,690 (2.75 hours) on 8/26/90; 16,495 (2+ hours) on 8/16/86 and 15,173 (no hours given) on 8/23/ 00. In recent years the migration has not been as heavy and peak days reported range from 1,200 to 3,000 Nighthawks. This lower migration is in keeping with concern about the decline of Nighthawks and other aerial feeding birds. For example, in Ontario the second atlas of breeding birds (2008) showed that the populations of the aerial foraging guild, including the Common Nighthawk, Whip-poor-will, Chimney Swift and six types of swallows, dropped 30 to 50 percent in the past two decades. Common Nighthawks in Duluth in August 2008.
seemed to migrate irrespective of wind conditions, with observations being recorded on days with westerly, southwesterly, southerly, and northerly winds. This count will be continued in August 2009. Other programs for monitoring Nighthawks have been started elsewhere in the U. S. The Northeast Partners in Flight created a Nightjar Working Group in 2004 and produced this report: ”Northeast Nightjar Survey – 2006 Summary.” Also the Center for Conservation Biology at the College of William & Mary has inaugurated a program called the Nightjar Survey Network; volunteer participants are welcome. This network essentially uses the USGS Breeding Bird Survey routes; it can be accessed at: http://www.ccb-wm.org/nightjars.htm.